What is the relationship between racial identity and a scientific field like physics? At first glance, they seem disconnected: one is a phenomenon of human society, the other studies physical rules of the universe. But physics, like all scientific disciplines, is a human endeavor. As such, racism and other forms of marginalization impact individuals working in the field. Filling Space spoke with Simone Hyater-Adams, a PhD student who studies underrepresented populations in the science, technology, engineering, and mathematics (STEM) disciplines. She shared her insight with us about the connection between racial and physics identities. Why did you decide to study racial identity in the field of physics? My motivation to study race in physics stemmed primarily from my own experiences as a black woman in the field. I decided to study physics after having a great time in my high school physics course. My teacher made the class interesting to me, and got me excited about the possibilities of explaining the world through math. I went to Hampton University, a historically black university, for my bachelor’s degree in physics. While the environment was far from perfect, the departmental faculty and staff’s support played a large part in my success there. However, even with this support and my ability to succeed in the field, I had trouble seeing myself doing physics research long-term, and I had trouble finding happiness in physics spaces. From my undergraduate experiences, I gained the understanding that negotiating my core identities – black, woman, and physicist – was going to be a difficult, unhealthy, and unhappy path for me. This led me to an interdisciplinary graduate program that allowed me to create this unique path I am on where I get to study the experience of struggling with my physics identity. This program allowed me to take up my own agency in understanding the hardships I’ve encountered while pursuing physics. At the same time, it lets me conduct research that will hopefully make things easier for future physicists like me. What are some of the more prominent biases you see, and what are some of the unexpected ones? First, a disclaimer: I pause at the wording of this question, because I don’t see certain biases as “prominent” and others as less so. I believe there is no hierarchy in oppression. It is always just wrong. With that being said, one of the biggest flaws of physics departments, and physics culture overall, is the idea that physics is not impacted by the politics of the outside world. This is not true. 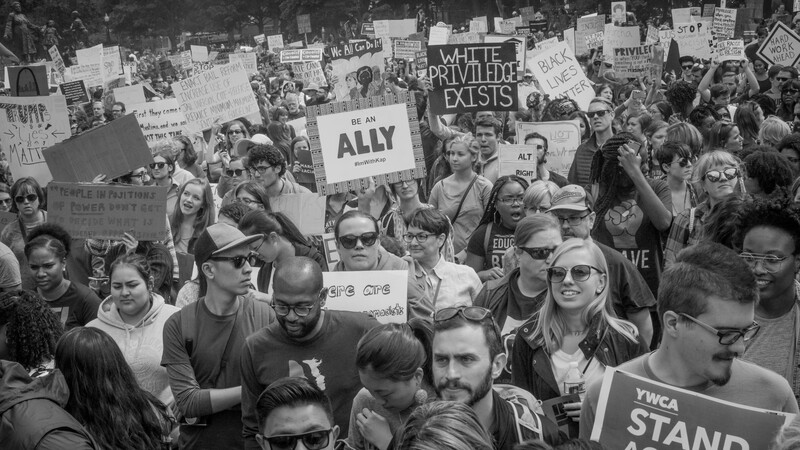 Many physicists believe that the experiences of discrimination, oppression, and bias that people from marginalized groups face day to day are extreme and violent. While extreme violence does happen often to our communities, most people who experience oppression do so through small insidious occurrences that seem natural to society. This is because the systems of oppression (i.e. racism, sexism, transphobia, and homophobia) are ingrained in our society. This common misconception leads physicists to believe that if they don’t see a black person being called the “n-word” every day in their department, then there is no problem. However, it seems okay to ignore the fact that there are often NO black people in departments at all. A pattern of bias that can (and has) impacted physicists and physics departments is the pattern of calling the police on innocent people of color. This year, I witnessed this in my own department when a student of color was seen as “suspicious” while they were in the physics building after hours. The police were called on the student and while in this instance he was not harmed to my knowledge, there is national data and countless examples in the media that show how easily such an encounter between the police and a person of color can escalate to death. In addition, the professor who was involved sent an email to the department lists warning others about this student, and included a non-consensual photo of the student. Our department’s response was to reassure the person who called the police that they had done nothing wrong, instead of acknowledging the harm that they caused and the potential danger they put this student in. The department’s inability to publicly respond to the incident and the email had two big consequences: (1) it communicated that students of color are not seen as normal or innocent bodies in that space and therefore look suspicious; and (2) it caused this student to leave the department. Silence from department faculty, administration, and staff in moments of injustice communicates that discrimination through people’s actions as well as department and university policy are welcome in your space. These messages contribute to why students of color, and of other marginalized identities, decide to leave the field. What advice do you have for individuals from underrepresented populations who want to pursue science, technology, engineering, and mathematics? (1) Find your circles and your supporters in and outside of your department or university. It is known that students of color feel like their worlds are fragmented when pursuing STEM. Make sure you have access to each space that will fulfill your educational and cultural worlds, whatever those might be for you. Also, no matter where you go, there are people who will go out of their way to make sure you are okay. When you get to a STEM space, the faster you find them, the better! (2) Speak up for yourself and advocate for what you need. Many physics students feel silenced in their classrooms and departments. If you are struggling and need support, there should be resources for that in your department and on your campus. Talk to your professors, advisors, and admin folks to figure out what resources are available to help you get through any issues that arise or even just tough classes. You may encounter barriers in the form of people, rules, and requirements, but being persistent and advocating for your needs is better than suffering in silence. (3) Give your time to yourself first, and choose wisely who and what you give it to next. Students of color, and students from other marginalized communities, often are the first asked to do things for others and the department. Especially when taking the advice in my second point above, it is not your job to do the work of educating your department and peers about your experience. It is also not your job to be the brown-faced representative for your department. Pick the opportunities presented to you wisely, and determine if they serve you or if they are serving others. This is a piece of advice I am still trying to put in action for myself!